In every inch of our universe, the fingerprint of the Divine can be seen. From the delicate spirals of seashells, to the ripples of raindrops on a mountain lake, we can witness the threads and patterns that make up the fabric of our world. These universal patterns that make up all of life are sometimes called “sacred geometry,” and these mathematical ratios, harmonics, and proportions are found in everything from architecture and music, to plant and animal life. 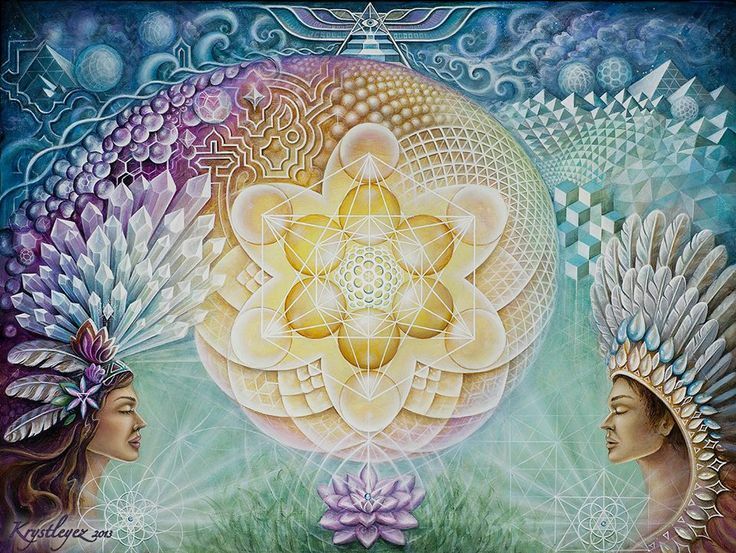 Many people are beginning to see the value of working with sacred geometry in their own healing practices, and finding the patterns and shapes that resonate with the energy they need at any given time. The vast world of sacred geometry can be distilled down to a handful of specific arrangements, which are used as building blocks for other, more complex shapes. You may be familiar with a couple of the more popular pieces of sacred geometry, like the Fibonacci spiral or the seed of life, but today, I wanted to share with you the beauty of the tetrahedron! For reference, I will be taking inspiration from the Sacred Geometry Cards for the Visionary Path by Francene Hart. For the science and math nerds out there, the tetrahedron is one of the five basic building structures of matter, also called the “platonic solids.” It is the simplest of the five shapes; it consists of four faces, four points, and six edges. The tetrahedron can be combined and expanded to create many amazing designs, which we’ll talk about here in a minute. Metaphysically speaking, the tetrahedron is associated with the sacred masculine, the element of fire, and energy of action and understanding. Working with this shape can illuminate your goals and desires, and help you find your inner source of motivation to bring them into fruition. It is an affirmation of your innate spark for knowledge and forward momentum, and can help you find clarity on what to do next. The simple tetrahedron is a supportive, strong, and intention-building design, woven into the Universal energy! Like I mentioned, the shape of the tetrahedron can be combined to make other structures that are important in the world of sacred geometry, and one of the most powerful ones is that of the Merkaba. The Merkaba is made up of two interlocking tetrahedrons, and is sometimes known as the double tetrahedron or the star tetrahedron. This is a very popular and potent design to work with, and can be used for a variety of healing purposes. It is representative of ultimate Divine harmony: male and female, heaven and earth, yin and yang, and the beautiful congruence of the human body. The term “Merkaba” can be roughly translated to the combination of “light” (Mer), “spirit” (Ka), and “body” (Ba). It is thought to align our physical, mental, emotional, and spiritual selves, and can help us get in touch with our highest vibration. In the sacred geometry deck that I love, the card for the dolphin Merkaba is all about joy, harmony, and play. Dolphins are sometimes considered sacred creatures, and guides between worlds, so their formation into the Merkaba shape is especially fun! We all have a multitude of dimensions inside us, and this sacred design can assist us in bringing everything into harmony once again, along with soul traveling. This calls us to find our inner joy, and learn to relax and have fun in this earthly plane. Such a wonderful message for our times, don’t you think? When we’re in harmony with our higher self and our place in the Universe, we can shine brightly and share the Divine joy and happiness that is oh-so-transformative! Another card in this deck that features the Merkaba is the Divine Mother card. You can see her arms stretched open, with this sacred design all around her. This particular energy invites us to honor the divine feminine within each of us, and to call upon the female god frequency when we are in need of healing. This is a celebratory card, filled with love, acceptance, and a sense of safety and belonging. The Divine Mother is here to illuminate your own inner goddess energy, in the likes of other female representations of the all-knowing Feminine, like Gaia, Mother Mary, Quan Yin, Isis, Green Tara, Pachamama, and many more. The feminine side of the Merkaba is a reminder that all is one and all is in harmony; pure, luminous non-duality is the true reality of nature. Our sacred oneness is something we often forget about, but this Divine Mother Merkaba is here to ask you to tap back into your connection to everything. We are all intimately tied to one another, each and every living thing on this planet and the worlds beyond. As with all forms in the natural world, the Merbaka, or star tetrahedron, can be added upon itself to make bigger and more complex designs. A larger version of this shape can be seen in the 64-star tetrahedron, and in the famous Cube of Metatron. "I arrived to the session feeling sort of disconnected and off balance, so it was perfect that we worked on activating my merkaba! As Paula held the space around my body's center of gravity, we called in my guides and angels to help enliven and balance the merkaba, so that I could be re-oriented again. Once everything was spinning nicely, I felt lighter overall, and my head felt much more clear. I walked out feeling grounded, confident, and supported by the Universe!" I invite you all to explore the tetrahedron and the Merkaba, and see what kinds of insights come to you! Stay tuned for another post on sacred geometry, later this month, where we’ll play with another set of powerful, healing shapes.